With SalesAutopilot, you have the opportunity to send blog alerts to any of your lists to notify your subscribers of your new blog posts. All you have to do is set a blog alert email and the corresponding delivery schedule, both of which will contain the special merge tags that will insert the content of the blog post into your email. However, having an RSS feed is a necessary condition for the blog alerts feature to work. All of the widely used blog engines have this (WordPress, Drupal, Joomla, etc.). If your blog doesn't have an RSS feed, for whatever reason, then you cannot use the blog alert feature. The format of the blog alert email can be plain text or Multipart (HTML). You will basically create an email that will serve as a template for your blog alerts. 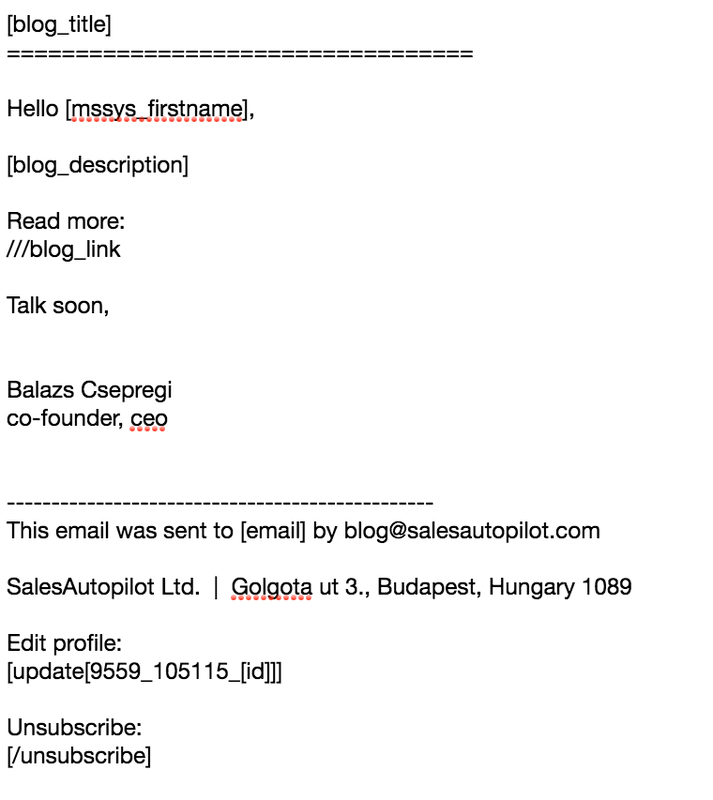 This template (email) will have the specific merge tags that will always insert the title and the summary (teaser) of your latest blog post. Besides the merge tags that are unique to blog alerts, the blog alert email can also contain any of the merge tags that can be used in every other email type. The picture below shows you the txt version of a blog alert. In the next picture, you can see the HTML version of the same blog alert. The email you create will become a blog alert when you assign the correct delivery schedule to it. 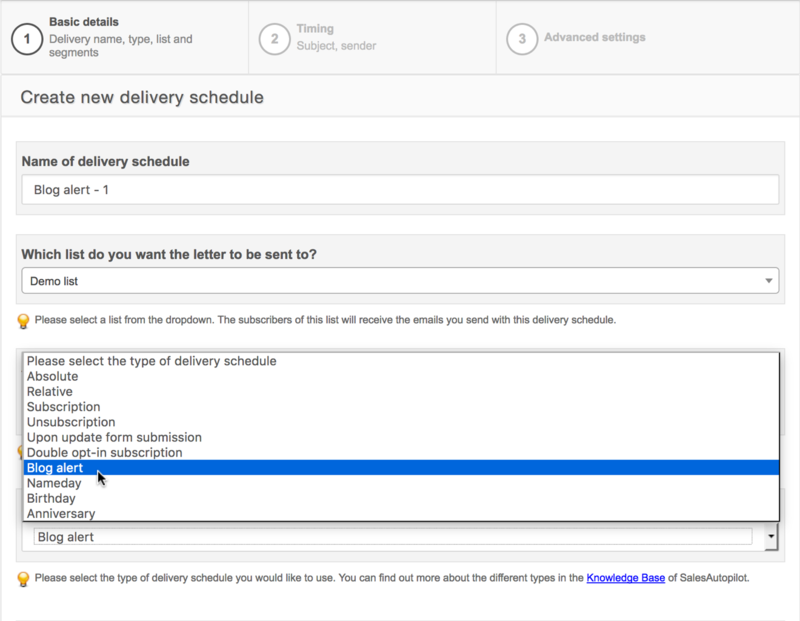 For this, you first have to select the list you would like to send the blog alert to and then select the "Blog alert" delivery schedule type, as shown in the picture below. On the second page of the create delivery schedule wizard, you will have to enter the entire URL of your blog's RSS feed. 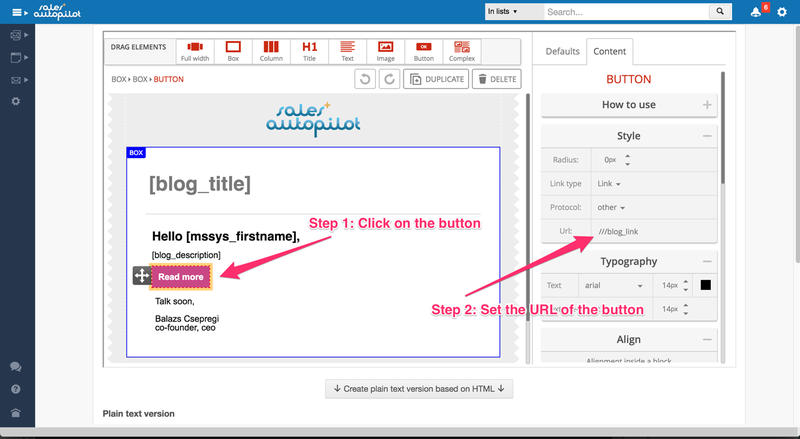 SalesAutopilot will read the blog post based on the RSS feed. If there is no RSS feed for your blog (very rare case), then unfortunately the blog alert feature will not work for you. You can also use merge tags relating to the blog post in the subject line of the delivery schedule. For example, if you would like to have the new blog post's title appear in the subject line of the blog alert email, use the [blog_title] merge tag, as you can see in the picture below. Why does SalesAutopilot check for blog posts only every 30 minutes, and why does it only send blog posts that were published in the last 30 minutes? The reasons are primarily technical. SalesAutopilot doesn't track which blog posts you send blog alerts for. Thus, it determines whether or not a blog post has been sent in the past based on the date and time it was published. This also means that when you update the time when a blog post was published, and the updated time falls in the last 30-minute period, then SalesAutopilot will send that post again, even if it has been sent before. How can you know ahead of time whether or not a new blog post will be sent and how many people will receive it? 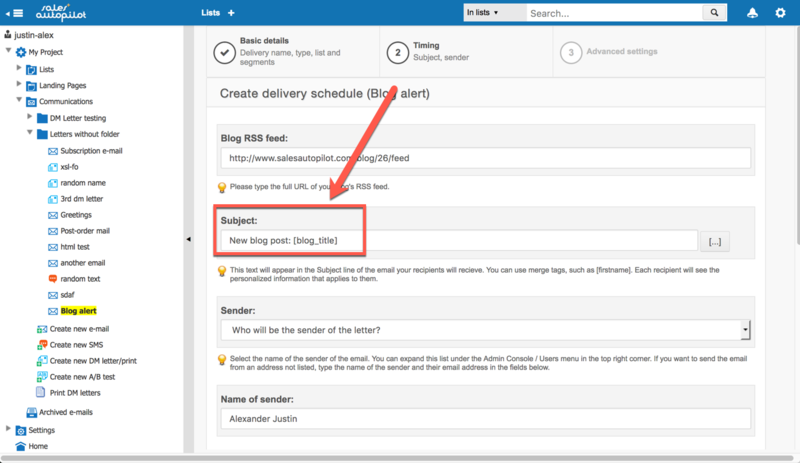 Click on the name of the blog alert email, and on the Email details tab open the summary of the delivery schedule that will send it. Under the "Projected number of deliveries" section you will see the title of the blog post and the time when SalesAutopilot will send it. You can see this in the picture below. If you cannot see the title of the blog post there, then probably its publication date does not fall in the last 30-minute period. If, for example, you published a blog post at 3:13 pm, then its title will appear under the delivery schedule from 3:13 pm to 3:30 pm as the next blog alert that will be sent. The delivery will start at 3:30 pm, and so you will no longer see it there, since it's not the next blog post that will be sent any longer. 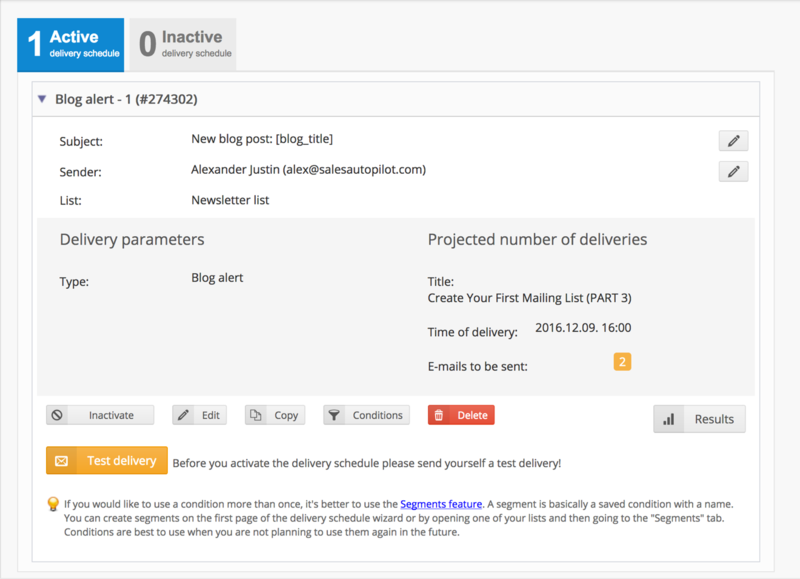 You can find out how effective your blog alerts are by clicking on the name of the blog alert email, going to the summary of the delivery schedule that sent it and clicking on the "Results" tab. This will open the graph that shows you how many blog alerts were sent each day. Below the graph, you will see a chart that summarizes the statistics of all of your blog alerts. Below this summary chart, you can see the click through statistics of all of your blog alerts separately. In the "Current e-mail version" section, you can see the results of the blog alert you most recently sent. SalesAutopilot remembers the title of the blog post and the date of the related blog alert.